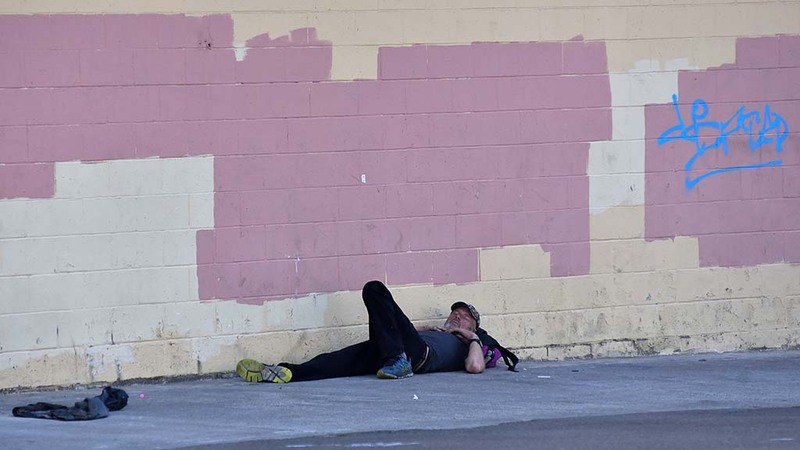 California, long considered a land of golden opportunity, has a homeless problem. To the north of San Diego, not far from the gates of the fantasy world at Disneyland, a two-mile long homeless camp reminds us of a real and ugly world. Street people are slowing rail traffic between Sacramento and the Bay Area, and swarming subway trains in Los Angeles in search of a place to sleep when they’re not languishing on Skid Row. California’s homeless problem goes beyond the alarming human tragedy playing out on the streets. Public spaces are being monopolized by the homeless, their poor sanitation has created a health hazard, and they’ve become a threat to infrastructure. When the encampment near Disneyland along the Santa Ana River was cleared earlier this year, workers in hazmat suits removed 250 tons of trash, 1,100 pounds of human waste, and 5,000 hypodermic needles. Up the road a bit, another kind of trouble has emerged. Homeless encampments next to railroad tracks have “contributed to a spike” in train travel delays, as well as “an outbreak of accidental fires and deadly collisions,” Fox News reported in April. There have also been problems with fires caused by inhabitants of homeless camps along rail lines. One that burned the wooden trestle crossing Willow Creek in San Jose last fall was thought to have started in the homeless encampment below. Meanwhile, there’s a stubborn homeless challenge on Skid Row in downtown Los Angeles. Appalling hygiene, overflowing litter, violent crime, and poor health are approaching crisis levels. Stating the obvious, the state auditor issued a report recently that said “California should do more to address homelessness” and “does a poor job of sheltering this vulnerable population.” The auditor suggests increasing public services, pouring in additional financial resources, and boosting the bureaucracy. But that’s no solution. This state and nation have more government than ever before and yet homelessness remains a problem. Lawmakers have a role, though. They could enact legislation to restore the financial incentives to build homes. California’s steep housing prices caused by a chronic shortage have forced gainfully employed people into the streets. Legislators could also pass laws further liberalizing the economy in a state that has an earned reputation for being hostile to business. A wave of hirings and promotions will lift many off the streets. These solutions will go only so far, though, since the majority of homeless are on the streets not due to a lack of housing or a restrained economy, but because of mental illness and chemical dependency. Lawmakers should promote a policy environment that allows the private sector to become more widely and deeply involved. In my Pacific Research Institute issue brief “Good Intentions,” I write about San Diego-area organizations such as Solutions for Change in Vista and Father Joe’s Villages in San Diego that have histories of successfully moving people off the streets. Faith-based institutions have also accomplished what government cannot with this group. While homelessness is tragic, like poverty, it will never be fully eliminated. But that doesn’t mean we shouldn’t try. We just need to look in the right places for solutions, which are not found in the halls of government. Kerry Jackson is a fellow with the Center for California Reform at the Pacific Research Institute. He is the author of the issue brief on California’s growing poverty problem, “Good Intentions,” which can be downloaded at www.pacificresearch.org.